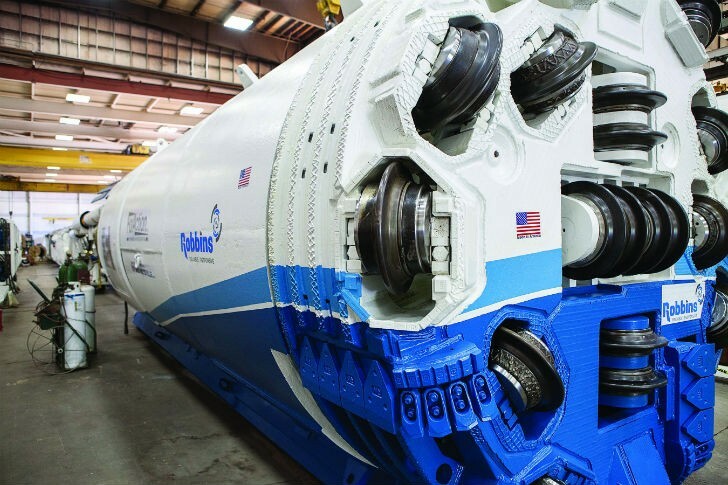 The 3.0 m (9.8 ft) diameter Robbins Double Shield TBM bored a 4 km (2.5 mi) tunnel below downtown Montreal. Lepinay characterized the ground as “almost ideal”, with a few difficult sections. “Below Montreal there is mostly thinly bedded limestone, with some shale and intrusive igneous dykes,” explained project geologist Brigitte Gagné for Exp Service Inc. While the limestone averaged 100-150 MPa UCS, rock in the intrusives ranged from 100-300 MPa. The dykes were as small as 1 m (3.3 ft) wide and as large as 100 m (328 ft). The contractor was able to successfully navigate these sections despite the varying rock strengths. Even with geologic challenges including some water inflows and over-break in small sections, the contractor was able to achieve advance rates of up to 38 m (125 ft) per day in two shifts of 9.5 hours each. Much of the ground was self-supporting, though the contractor installed rock bolts every 2.5 m (8.2 ft) into portions of the tunnel crown, while mesh, rock bolts, and steel sheets were used in the sections of unstable rock. The long tunnel drive at small diameter was carefully planned to optimize logistics. The contractor utilized a muck train that could accommodate two pushes worth of excavated material. The first kilometre (0.6 mi) was ventilated from the launch shaft, while three surface-driven 800 mm (32 in) diameter surveying wells at the 1, 2, and 3 km (0.6, 1.2, and 1.9 mi) marks ventilated the rest of the tunnel as the TBM progressed. With the breakthrough, an important phase of the Rosemont Reservoir project is complete. The reservoir itself was built in 1960 to increase water supply to the city and a geotechnical study for the tunnel was carried out in 1977. However, other major infrastructure projects soon took priority and the project was placed on hold. By 2010, the population of the city had increased dramatically and problems with the existing reservoirs put the project back on the fast track. The large reservoir that sat idle for decades will now be used to improve much of the city’s water supply. As of mid-January the contractor is working to ready the tunnel for installation of the carrier pipe, consisting of 2.13 m (84 in) I.D. pre-stressed concrete cylinder pipe (PCCP). Crews will then grout the pipe in place in preparation for the Rosemont Reservoir to come online. Workers climb through the cutterhead of the Robbins TBM to mark the breakthrough in November 2015 at a large ceremony.